June 25, 2018 – Rao was previously the associate editor for the Journal of the American College of Cardiology and the American Heart Journal. The DCRI’s Sunil V. Rao, MD, will become the new editor-in-chief of Circulation: Cardiovascular Interventions, one of 12 American Heart Association (AHA) scientific journals, on July 1. Circulation: Cardiovascular Interventions, an American Heart Association journal that launched in 2008, focuses on interventional techniques pertaining to coronary artery disease, structural heart disease and vascular disease, with priority placed on original research and on randomized trials and large registry studies that advance clinical practice and patient outcomes. Rao is Professor of Medicine at Duke University Health System, Chief of Cardiology at the Durham Veterans Affairs Health System, and a member of the DCRI. His main research interests deal with pharmacological and interventional therapies for acute coronary syndromes, as well as bleeding and blood transfusion complications among patients with ischemic heart disease. He has led several clinical trials in the interventional cardiology space, and he has published over 200 papers in leading medical journals. 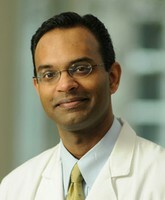 Rao is a former associate editor for the Journal of the American College of Cardiology and the American Heart Journal. In addition, he was the Editor-in-Chief for the ACC CathSAP 5 and will be the meeting chair for the 2019 Society for Cardiovascular Angiography and Interventions Annual Scientific Sessions. “We are confident that Dr. Rao will bring the highest level of dedication and commitment to excellence in the publication of cardiovascular intervention research,” said Mark Estes, MD, chair of the AHA’s Scientific Publishing Committee and Professor of Medicine at the New England Cardiac Arrhythmia Center at Tufts University School of Medicine. This entry was posted in 2018 News Archive, News. Bookmark the permalink.